Warm sun, nippy wind. Socks full of stickers, had to stop every quarter mile to pick them out. North of Stud Stallion Wash we crossed the pitted sandstone to the ridge. Tucked in a cliff face below a little ponderosa and above a cluster of dry tinajas—natural rain catchment tanks—we came upon what was probably a nineteenth-century sheepherder’s hole-up. 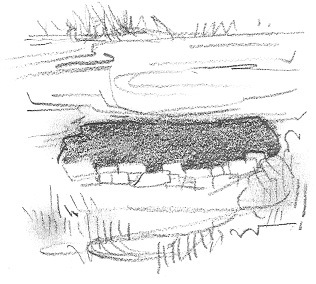 It was a smoke-blackened rock shelter partly enclosed by a stone windbreak. Cozy place. You could spread your skimpy bedroll behind the stone wall and look out over the wide saddle of the syncline with its mysterious stone circles and prehistoric deer-hunter meadows and, at night, a field of stars.